I have already accessed other advertising platforms. Can I also receive ads provided by the DU Developer Platform? Yes, even if you have already accessed other advertising platforms, you still can receive ads provided by the DU Developer Platform and get paid. Does the platform have any browser requirements? Currently, the platform recommends the use of Chrome, IE9+, or Firefox. How can I become a DU Ad Platform developer? First, sign up as a platform user. Second, fill in your basic information and financial information. Third, in My APPs, ad an APP and create a placement. Then, embed SDK. Fourth, accept and display ads provided by the platform to get paid. I forgot my login password. What should I do? Click Log in on the DU Developer Platform's official website and select Forgot Password. Follow the prompts from the platform to retrieve your password. Why do I need to fill in my basic account information? The platform may need your help to develop better platform features so as to provide better services to you. The platform will not disclose your personal information. Why do I need to fill in financial information? Entering correct and complete financial information allows you to make withdrawals. The platform will not disclose your personal information. Why did the email address I registered not receive the activation/reset password email? Some email servers may classify our emails as spam or junk mail. You can check if this happened. Step 1: Fill in basic app information. Step 2: Create a Placement_ID. Step 3: Submit market address and wait for audit. Step 4: Download SDK and integrate it into the APK. After audit, you can earn profits by displaying ads. What are the roles of App IDs and placement IDs? App IDs and placement IDs are automatically configured by the platform. They are unique identifiers used to identify apps and ad placements. The platform uses them to compile statistics of and separate the revenue and specific operation data for different apps and placements. Where can I download the SDK? You can download various types of SDKs in the SDK download menu on the DU Ad Platform's official site. How do I embed SDK in an APP? 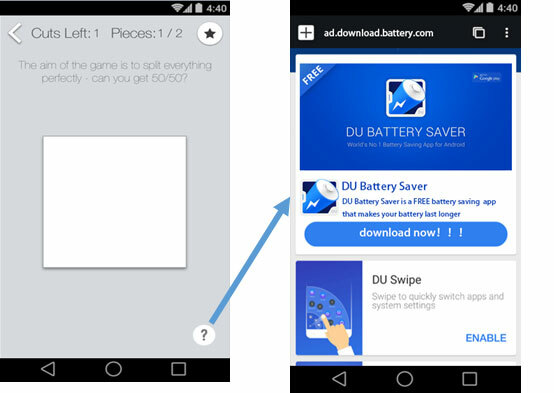 When your app successfully embeds SDK, it can receive test ads. Test ads do not generate any revenue. After your app has been approved, it will receive official ads, which generate revenue. What is the difference between Fill and Load? How can I control the timing of these two interfaces? Fill means to send ad request to the server and save the ad to device memory. Load means to get the ad from device memory. If there is no ad in device memory, it will send an ad request to server again. We recommend that you use Load 3-4 seconds after using Fill. It will help to improve the impression speed. Can I request an ad by using one DAP placement ID (pid) for different package names? No. DAP will check whether your package name, app license and pid are the same as those registered on DAP. Why do I always get ErrorCode 3000 after integrating the DU SDK? A. The package name, app license and DAP placement ID (pid) must be the same as those registered on DAP. B. The network condition is good enough for testing. C. Your app/placement status on DAP is ‘Publishing’. D. The test device in China must be connected to a VPN. Do I have to apply for a Facebook placement ID when integrating the DU SDK? It is not mandatory to have a Facebook placement ID. Without a Facebook ID, you can only apply for a DAP placement ID for monetization. With a Facebook placement ID, DAP can help developers to dynamically rank multiple ad channels with our “peak selection algorithm” to maximum monetization revenue. I filled in the Facebook placement ID in the DU SDK, but cannot receive Facebook ads on my test device. Why? Please make sure your test device has a VPN connected and make sure the Facebook app has been installed and is logged in on your test device. Why can I still receive ads after I paused my DAP placement? After you paused your DAP placement, the ad source from DU will be closed. 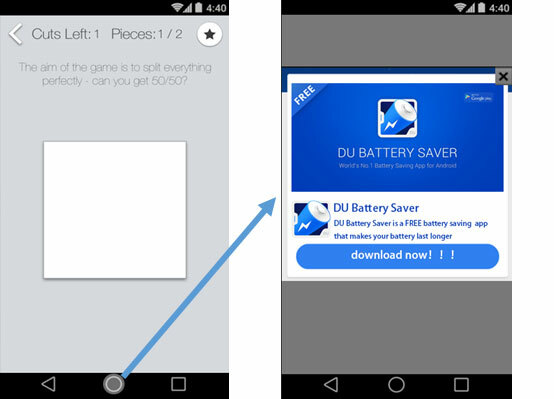 If you fill in a Facebook placement ID in the DU SDK, you can still receive ads from Facebook. The Facebook placement can be closed on https://developers.facebook.com/. By primarily using the ad monetization model, the DU Ad Platform strives to provide benefits to both developers and users. To ensure that your product provides an optimal user experience, please be sure to comply with the policies below. To access our services, apps shall not include deceptive or disruptive ads. Ads served in your app shall be viewed as part of the app itself, and shall comply with all our policies. We shall regularly review the ads served in your app. If we find that your app is not in compliance with our policies, we shall no longer serve ads to it. Any ad shall not simulate or impersonate any app interface or operating system notification/warning message. It shall be clear to users which app is serving each and every ad. Ads that simulate app interfaces: These ads use similar icons to those in the apps they are served in, but when users click them, they are redirected to an external landing page. The icon shown in the image above will take users to an external ad. Ads that simulate system notifications: These ads are displayed to users in the form of system notifications. This image shows an ad that looks like a system notification. Ads shall be displayed in a way that they prevent users from clicking on them accidentally. Users shall not be forced to click on an ad or required to submit their personal information for advertising purposes in order to fully use the app. Interstitial ads shall only be displayed in an app that serves such ads. If your app displays interstitial ads or other ads that disrupt normal use of the app, you shall allow users to easily close the ads without incurring any loss therefrom. The ad shown in this image does not display a close button. Ads displayed in your app shall not interfere with other apps, ads, or device operations (including system or device buttons and ports). These ads include overlay ads, supporting functions or component-based ad units, and shall only be displayed within the app they belong to. The ad in this image suddenly appears on the device home screen when a user switches from the app to the home screen. 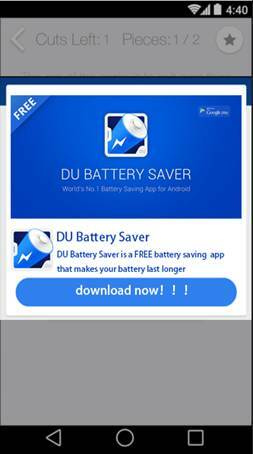 The DU Ad Platform guarantees that ads served on it shall comply with the Google Play ad policy on ad quality. Likewise, developers shall have the responsibility to understand and comply with all applicable laws and specifications. In case of violations thereof on the part of developers in any way, they shall be solely responsible for any consequences caused thereby. What sort of APPs will not be approved? How long is the review cycle? The review period is from Monday to Friday every week. Each weekday, processing for APPs submitted that day will begin at 6: 00pm (Chinese time). Apps submitted after 6: 00pm will be reviewed on the next business day. In some special cases, emergency review may be performed. In this case, please contact customer service or email dussp@baidu.com . How do I view the review status? You can view an APP's review status at any time through the APP list in My APPs. When the number of impressions is larger than the number of requests, or the number of requests is much higher than the number of impressions, will these affect my monetization revenue? The ratio of impressions and requests on DAP will not affect your revenue. This is because multiple ads are returned by one request and there is caching logic in DU SDK. How often will the data on DAP be refreshed? Due to time differences, DAP will refresh the data every 2, 4, 24, and 48 hours. Why there is no impression or click data about my app on DAP? This might be caused by incorrect integration. Please follow the guidance of our manual and demo to see if there is any process you missed. Please pay particular attention to theregistration in AndroidManifest.xml and the usage of interface “registerViewForInteraction(View view)” . Why do I have impression data but I see no revenue on DAP? For CPA offers, if users don’t install and active the ad app, there will be no revenue. How do I get ad revenue? When you submit an APP and it is approved by the platform, you can get paid through this ad. The system uses the App ID and placement ID registered when you embedded SDK to identify your APP and ensure your interest is not stolen. You can view the operation data and revenue for your APPs through the Homepage or My Data page on the platform. How do I request a withdrawal? What is the withdrawal period? On the fifth of each month, the revenue earned from the 1st to 31st of last month will be settled (if the 1st is a holiday, the date is pushed back). For withdrawal amounts greater than $100, you can request a withdrawal by clicking the Withdraw button on the Homepage or Financial Records. After the 11st of each month, withdrawal requests from the 11st of last month to 10th of this month will be collectively processed. The money will be transferred before the end of the month（in case of holiday）. We recommend you to submit withdrawal request between 6th and 10th, so you can receive payment much soon. Which currency type does DU Ad Platform support in settlement? Does the platform have any requirements about bank account? The bank account can not be opened by banks of mainland China, and must support receiving dollar remittance. Developers shall be liable for making payment of any and all applicable taxes, including but not limited to withholding tax, value added tax, sales taxes, duties, fees, levies or surcharges (including where applicable any universal service fund or similar surcharges) imposed by, or pursuant to the laws, statutes or regulations of any government agency or authority. Baidu attaches great importance to protecting your privacy. Before using the services provided by Baidu, please carefully read the following statements. Baidu will only collect and use your personal information in order to provide you with more accurate and well-targeted services. Baidu will treat such information with a high level of diligence. 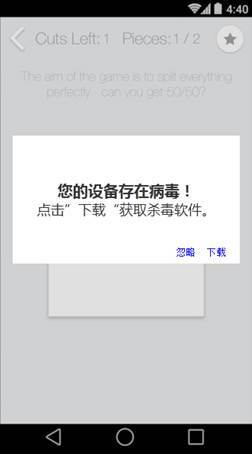 You agree and understand that Baidu may use the personal information submitted by you in the following manners. Without your permission, Baidu will not disclose such information or provide such information to any third party. Baidu will collect your personal information when you voluntarily select our services or provide such information. Baidu will integrate your personal information so as to provide better services. Baidu will not be responsible to you or any party if any personal information provided by you is inaccurate, untruthful, or outdated. Baidu will not retain your personal data for longer than is necessary to provide products and services requested by the User. You can prevent the application of cookies by changing your browser settings, but as a result, you may be unable to access certain Baidu services and functions which rely on the transmission of cookies. When you use Baidu’s services, the server will automatically record certain information, including URL, IP address, type of browser, language used, and the date and time of visit, etc., with the sole purpose being to provide you with better services. We will seek your consent before using your personal information for a purpose other than those included in this Statement of Privacy. We need to provide the companies providing products or service on our behalf with your personal data (unless we notify you, such companies shall have no right to use or process your personal data). Baidu will take all appropriate measures to prevent the illegal or unlawful disclosure, modification or destruction of user’s information. Please be informed that your personal data may be transferred to locations outside of the territory where you are accessing Baidu’s services or disclosed to our related corporations, licensees, business partners and/or service providers for the purposes described above. We encrypt our services and data transmission using SSL. We strive at all times to ensure that your personal data will be protected against unauthorized or accidental access, processing, correction or deletion. We implement appropriate security measures to safeguard and secure your personal data. You have chosen to disable the current browser cookie, but you can also opt back in at any time. If you choose to re-enable, we will recommend information that is more relevant or more interesting to you based on your preference information when you visit the Baidu website. To make the ads you see more useful to you when using Baidu services and non-Baidu websites and apps partner with Baidu to show ads, Baidu will collect your preference information through cookie( not involve any information on your personal information). If you don’t want Baidu to use the recored preference information to recommend personalized promotion information to you, you can use the button above to choose to disable. After deactivation, Baidu will no longer recommend personalized promotion information to you based on your preference information. The personalization configuration tool only applies to the current browser on the computer you are currently using. And, when you delete the cookie of the current browser, the system will automatically reset your browser’s personalized configuration settings.